Tamil-Brahmi, or Tamili aka Tamizhi is a variant of the Brahmi script used to write the Tamil language. These are the earliest documents of a Dravidian language, and the script was well established in the Chera and Pandyan states, in what is now Tamil Nadu, Kerala and Sri Lanka. Inscriptions have been found on cave beds, pot sherds, Jar burials, coins, seals, and rings. The language is Archaic Tamil, and led to classical Sangam literature. Brahmi, developed in the mid-1st millennium BCE, is the oldest known writing system of Ancient India, with the possible exception of the undeciphered Indus script. Brahmi is an abugida that thrived in the Indian subcontinent and uses a system of diacritical marks to associate vowels with consonant symbols. It evolved into a host of other scripts, called the Brahmic scripts, that continue to be in use today in South and Central Asia. 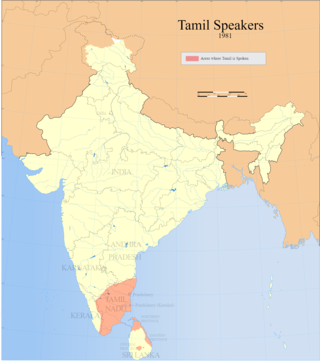 The Tamil people, also known as Tamilar, Tamilans or simply Tamils, are an ethnic group who speak the language Tamil as their mother tongue and trace their ancestry to southern India and northern Sri Lanka. Tamils, with a population of around 76 million and with a documented history stretching back over 2,000 years, are one of the largest and oldest extant ethnolinguistic groups in the modern world. Tamils constitute 5.9% of the population in India, 15.3% in Sri Lanka, 6% in Mauritius, approximately 7% in Malaysia and 5% in Singapore. 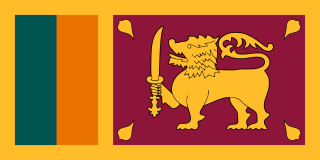 Eelam is the native Tamil name for the South Asian island state of Sri Lanka. Eelam is also a name for the spurge, toddy and gold. The exact etymology and the original meaning of the word are not clearly known, and there are number of conflicting theories. The Retroflex approximant l in Eelam is a characteristic phoneme for Dravidian languages, retained in closely related Tamil and Malayalam. 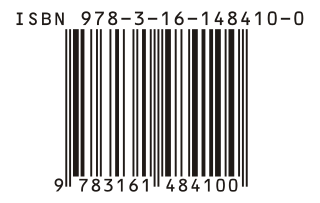 Conventionally it has been represented in the Latin script with the digraph zh. Tamilakam or Ancient Tamil country refers to the geographical region inhabited by the ancient Tamil people. Tamilakam covered today's Tamil Nadu, Kerala, Puducherry, Lakshadweep and southern parts of Andhra Pradesh and Karnataka. Traditional accounts and Tholkāppiyam referred these territories as a single cultural area, where Tamil was the natural language and culture of all people. The ancient Tamil country was divided into kingdoms. The best known among them were the Cheras, Cholas, Pandyans and Pallavas. During the Sangam period, Tamil culture began to spread outside Tamilakam. Ancient Tamil settlements were also found in Sri Lanka and the Maldives (Giravarus). Tamraparni (Tamil/Sanskrit) is an ancient name of a river proximal to Tirunelveli of South India and Puttalam of Western Sri Lanka. A toponym, "Tamraparniyan" is eponymous with the socio-economic and cultural history of this area and its people. Movement of people across the Gulf of Mannar during the early Pandyan and Anuradhapura periods, between the Tirunelveli river of Pothigai, Adam's Peak and the estuary of the Gona Nadi/Kala Oya river of Northwest Sri Lanka, Java and Sumatra led to the shared application of the name for the closely connected region's culture. The entire island of Sri Lanka itself was known in the ancient world as "Tamraparni", with use dating to before the 6th century BC. It is a rendering of the original Tamil name Tān Poruṇai of the Sangam period, "the cool river Porunai". The earliest traces of epigraphy in the Indian Subcontinent are found in the undeciphered inscriptions of the Indus Valley Civilization, which date back to the early 3rd millennium BC. Two other important archeological classes of symbols are found from the 1st millennium BCE, Megalithic Graffiti Symbols and symbols on punch-marked coins, though most scholars do not consider these to constitute fully linguistic scripts, and their semiotic functions are not well understood. The earliest deciphered epigraphic inscriptions of significant length are the Edicts of Ashoka of the 3rd century BCE, written in forms of Prakrit in the Brahmi script. Samanam inscriptions in South India written in Tamil-Brahmi, Bhattiprolu alphabet and the Kadamba alphabet are also of relatively early date. Some Tamil-Brahmi inscriptions discovered at Palani, Erode, and Adichanallur, have been claimed to be as ancient as 500 BCE, but so far only the claimed pre-Ashokan inscriptions at Anuradhapura in Sri Lanka have been published academically. There are literary, archaeological, epigraphic and numismatic sources of ancient Tamil history. The foremost among these sources is the Sangam literature, generally dated to the last centuries BCE to early centuries CE. The poems in Sangam literature contain vivid descriptions of the different aspects of life and society in Tamilakam during this age; scholars agree that, for the most part, these are reliable accounts. Greek and Roman literature, around the dawn of the Christian era, give details of the maritime trade between Tamilakam and the Roman empire, including the names and locations of many ports on both coasts of the Tamil country. Tissamaharama Tamil Brahmi inscription refers to a fragment of black and red ware flat dish inscribed in Brahmi script excavated at the earliest layer in southern town of Tissamaharama in Sri Lanka. It is dated to approximately 200 BC by German scholars who undertook the excavation. The inscription is mix of Brahmi letters and Graffiti symbols. Kudiramalai is a cape and ancient port town on the west coast of Sri Lanka. Professor Karthigesu Indrapala is a Sri Lankan academic, historian, archaeologist, author and former dean of the Faculty of Arts, University of Jaffna. Megalithic markings, Megalithic graffiti marks, Megalithic symbols or Non-Brahmi symbols are terms used to describe markings found on mostly potsherds found in Central India, South India and Sri Lanka during the Megalithic Iron Age period. They are usually found in burial sites but are also found habitation sites as well. They are tentatively dated from 1000 BCE to 300 CE marking the transition of the proto-historic period into the historic period of South Asia. A number of scholars have tried to decipher the symbols since 1878, and currently there is no consensus as to whether they constitute un-deciphered writing or graffiti or symbols without any syllabic or alphabetic meaning. From archaeological stratigraphy, potsherds with and without symbols are usually found at the lowest level, followed by potsherds with mixed symbols and Brahmi or Tamil Brahmi and eventually at the highest level potsherds are only found with Brahmi or Tamil Brahmi etchings. From around 300 CE, they disappear from grave sites. Scholars such as Iravatham Mahadevan have tried to link the symbols directly to Indus Valley script or as derived due to lingering influence, whereas others such as K. Rajan see the symbols as the genesis of the later Brahmi script. Yet many others see no particular alphabetic value in them only as graffiti symbols used for socio-religious purposes. Raghupathy, Ponnambalam (1987). Early settlements in Jaffna, an archaeological survey. Madras: Raghupathy.